Ferrari team principal Stefano Domenicali says rivals Mercedes and Williams have prepared better for the start of the new Formula 1 season than the Scuderia. Fernando Alonso clocked the third fastest time on the final day of pre-season testing in Bahrain on Sunday, but wound up a second adrift of Lewis Hamilton's pacesetting Mercedes, and 0.7s alower than Valtteri Bottas's Mercedes-powered Williams. Ferrari has also suffered a number of niggling reliability issues with the F14 T and Domenicali said the team has work to do to catch up. "At the end of this session we have done around 4000km, Mercedes close to 5000, Williams more or less close to that number, that mans at the end of the day they prepare better for the start of the season," he said. "It's a fact, so we have to start from this consideration, knowing that there is a huge amount of work to be done. "Williams and Mercedes seem to be in very good shape, but that's what we have seen so far. I think we have a good base and we need to develop it. "There is a lot of potential that needs to be discovered, that is the objective our engineers have to fix as soon as possible because the points we will score at the beginning of the season will be very heavy." Domenicali suggested Ferrari still has not worked out how to extract the best from its new power unit, which appears to lag behind the Mercedes engine package at present. "I think the most important thing to understand on our side is how to manage the balance between electrical power, the ERS, the battery, all these things have an effect in terms of horsepower," he added. 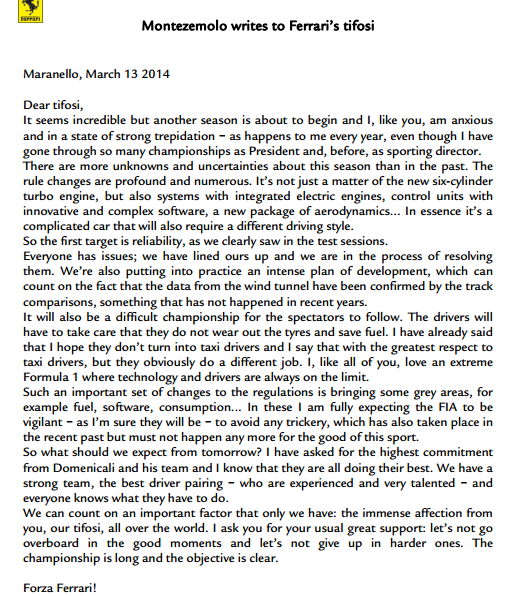 "We also need to get used to the massive difference of the car in terms of layout and management. "This will have an effect on everyone, because if you have an issue, depending on what it is, during FP3 it will be an interesting challenge to be ready for qualifying, so I think that everyone has to learn. "Some have shown to be a little bit ahead of the others, but let's wait and see when it counts." He says that they ran a very strange test program and that Merc could not make any sense about their program and what they were doing. AMuS thinks that Ferrari could not use constantly the 160 HP of the MGU-K, but usually used 120 HP. All in all they speculate that Ferrari gave away 1.5s because of the conservative engine settings (I assume they mean 1.5s during long runs). Also, rumours are that Ferrari should be marginal with consumption. It seems now confirmed that Ferrari uses the MGU-K to blip the engine at downshifting. An Expert: "You do that when you have consumption problems". Mercedes thinks that this is a waste of electrical energy which could be brought to better use. Toyota disagrees, they have investigated this for their LMP1 (Le Mans) program and say that doing it electrically has no negative effects and is the best way for the gearbox. - Same story 2 days before: Alonso 338,5 km/h, with an associated lap of 1:40.634. - And the same the other way around: In his absolute top lap Alonso reached only 308,5 km/h, over 30 km/h slower than what was possible. The Sector times in his fastest lap were not recorded, Ferrari mentioned transponder problems. - No other team had so many empty data points in the sector time detection. And this in every testing day. Only at the start-finish line and at top speed measurements Ferrari could not hide anything, as this is not only measured with the transponder but also by other means. There are no empty data points with those measurements. - Adding the best sector times of Alonso, measured officially by Ferrari, the quickest lap would be 1:35.559, 1,279 sec slower than his best lap, which is a "guaranteed" time. There are some unclear things in this report, though, but Ferrari clearly is an enigma. I forgot that AMuS says, Domenicali, Alonso and Räikönnen are surprisingly calm. Normally, with one second gap, the roof would already burn at Ferrari. Also, in that interwiev when Domenicali admitted that they were behind Merc and Williams, after all microphones had been switched off, he added that the gap isn't that big and that they can close it. But like he said: " it's not my habit to predict and in this season even less so ". No one really knows what other qualities the "best car" should have this season, besides being fast and reliable. Scuderia Ferrari is more than a Formula 1 team. Its history and achievements are more than just words and statistics in a book, it embodies the spirit of a nation and transcends the sport. Ferrari are the only team to have contested every Formula 1 race since it began in 1950. There is a reason Fangio, Lauda, Schumacher and Alonso are considered greats of the sport, their achievements are one thing, but it’s because they achieved it in a Ferrari that makes them legends. Through unprecedented access to the factory at Maranello, its engineers and racing drivers Fernando Alonso and Kimi Raikkonen this film will lift the veil off of the highly secretive world of manufacturing a Formula 1 racing car. Underneath the ‘Rosso Corsa’ (red paintwork) is the beating heart of this iconic thoroughbred racing machine; its prancing horse, the engine. In 2014, Formula 1 is switching to a new and untested 1.6 litre V6 turbo engine; the technical challenges of which cannot be underestimated. Five years without a World Championship at Ferrari means the pressure to deliver a championship winning car is greater than ever. This is a candid, honest story following the people at the heart of Ferrari trying to bring success back to this Italian institution in the build up to the first race of the 2014 season. Bottas said he didnt have to save fuel in Bahrain at all..if its a Mercedes engine feature , others are in trouble , as there are a few long straights in Bahrain. Melbourne should then be a piece of cake to Merc as its rather slow track. Has Alonso achieved for Ferrari something? Or do they mean his previous championships? I think Melbourne is one of the tracks were fuel will be most limited. So might get difficult for all and we will see them lapping much slower in the end. Or forcast is true and it will rain and it will be a big mess.. I think that the phrase "let's not give up in harder ones" is the main thing of this whole letter. Ferrari tifosi are very critical and not very patient. I think they are anticipating themselves if, after all they've done, they still don't win. Very nice stuff ( cant decide what to buy, want a lot but i'll restrain myself ), but much nicer Kimi!!!!! JJ Lehto said that Fernando Alonso is able to utilize the benefit of poor car better than his current team-mate. Lehto does not believe that Ferrari favoring Alonso. 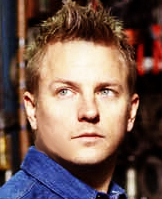 I agree with Lehto so far, K.
I can't remember the last time I've seen Kimi look so lost. You can see Alonso "wringing the neck" of his F 14T. Kimi isn't able to push with the same amount of confidence.